Nutmeg has the Latin name Myristica fragrans. It is also known by other common names in various countries as mace, muscadier, magic, muskatbaum, noz moscada, myristica, nuez moscada and nux moschata. The nutmeg tree grows very tall and may reach up to seventy feet in height. 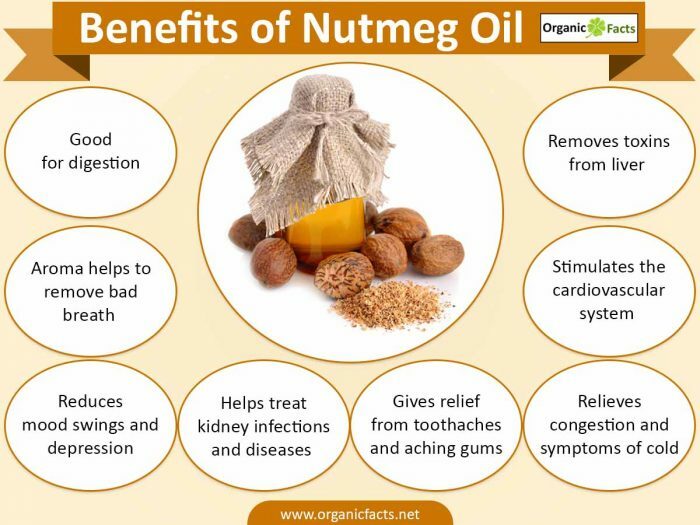 Nutmeg oil is obtained from the seed of the nutmeg tree fruit. The fruit, when dried, produces nutmeg (the seed) and mace (the covering). Traditionally, nutmeg was believed to be effective against the plague and hence it was popular during the Elizabethan era. Nutmeg oil is very useful for treating muscular and joint pain as it is an excellent sedative. It is also anti-inflammatory, so massaging nutmeg oil on the affected area is an effective treatment for arthritis, rheumatism, and lumbago. Nutmeg oil is an essential part of Chinese medicine when it comes to treating abdominal pain and inflammation. It also reduces swelling of the joints. Often, overexertion leads to body or muscle ache, and in such cases, this oil can be very useful in removing the pain. Nutmeg oil is good for digestion and helps in relieving stomach aches and removing gas from the stomach and intestines. Therefore, it is good for indigestion, flatulence, vomiting, and diarrhea. It also encourages an increase in appetite. Care should be taken when consuming nutmeg oil, and it should only be applied internally in low doses. Nutmeg oil is a good stimulant, not only for the mind but also for the rest of the body. Its relaxing aroma comforts the body, increases blood circulation and therefore helps those who have poor blood circulation. Nutmeg oil forms an important ingredient in many cough syrups and cold rubs as it helps in relieving congestion and cold symptoms. It is also believed that this oil can be used for treating asthma. Nutmeg oil stimulates the brain and therefore removes mental exhaustion and stress. It is also believed that this oil improves the quality of your dreams, making them more intense, colorful, and positive. It is a good remedy for anxiety as well as depression. The oil is often used in homeopathy. In the ancient Greek and Roman civilizations, nutmeg was popular as an effective brain tonic in spite of its high cost and rarity. It also enhances concentration and increases your overall efficiency at study and work. Nutmeg oil can also stimulate the cardiovascular system and is therefore considered a good tonic for the heart. The woody aroma of nutmeg oil helps to remove bad breath. It is also antiseptic in nature and is effective for toothaches and aching gums. As a result, it is also added to numerous toothpaste and mouthwashes. Nutmeg oil is often recommended for treating kidney infections and kidney diseases. It also helps in dissolving kidney stones and accumulated uric acid in other parts of the body, like those which lead to gout and joint inflammation. Nutmeg is used in various incense sticks due to its woody fragrance. It is also believed that Roman priests used to burn nutmeg as incense.